"I'm proud to be a Mogami Mami! I've used these cables for several years cuz they're simply the best in the industry. Tough and durable, they're made with the highest standard and quality. Mogami cables provide the link between all the hard work we put into our craft and everybody's ability to hear it loud and clean." Her journey started on the burgeoning music scene in Atlanta, GA after falling in love with the bass guitar while studying Journalism at UC Berkeley. Her career as a bass-player skyrocketed after attending a bass camp led by the legendary Victor Wooten where she was invited to tour with him merely three months after the bass camp. With limited funds, a heart full of passion and an energy that exudes resilience, she auditioned for Beyoncé and was selected as a band member and assistant Musical Director. While touring and working with the super-star for over 5 years, Divinity appeared on countless television shows including: The Grammy's, The Oprah Winfrey Show, Saturday Night Live, Good Morning America with personal highlights including a special performance at The White House for President Barack Obama. Divinity also acted as the Musical Director for K-Pop sensation, 2NE1 and joined them on their first worldwide New Evolution Tour in 2012. She recently played The Arsenio Hall Show, 106 and Park and The Queen Latifah Show with rapper B.o.B. and has backed legends like Patti Labelle, Kelly Rowland and Erykah Badu on BET's Black Girl's Rock television show. Despite these appearances with so many legendary and iconic figures, it is in her solo performance Divinity shines the brightest. Her ability to simultaneously play bass guitar while fronting her own band captivates audiences around the world. 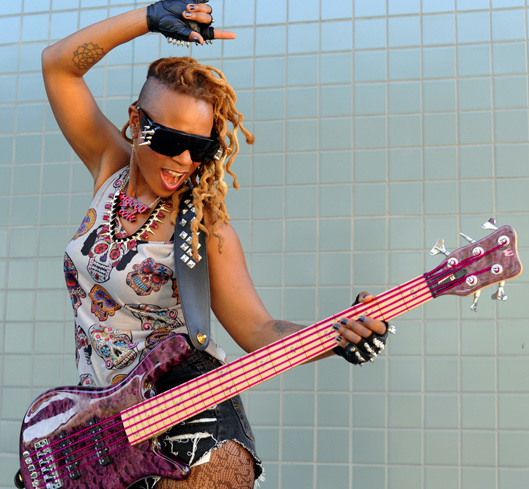 Her 2012 'Roxx Boxx Experience' received critical acclaim as the ultimate funk mash-up of hip-hop and rock, featuring appearances by Grammy award winning artists and musicians Bootsy Collins and Killa Mike. 2016 will be the year of evolution. Divinity is releasing her highly anticipated album, 'ImPossible.' From jazzy riffs to dub bass lines, hip-hop and rock, to straight r&b sensibilities, she is breaking down walls and displaying a bit of vulnerability on her new project. Still resilient, still bold and honest, this is Divinity's breakout project. We truly get a sense of the artist she has evolved into and the purpose of her art. The first single, 'We Are', was released in 2015, produced by the great Keith Harris and inspired by the late June Jordan, her most influential professor while studying at UC Berkeley.